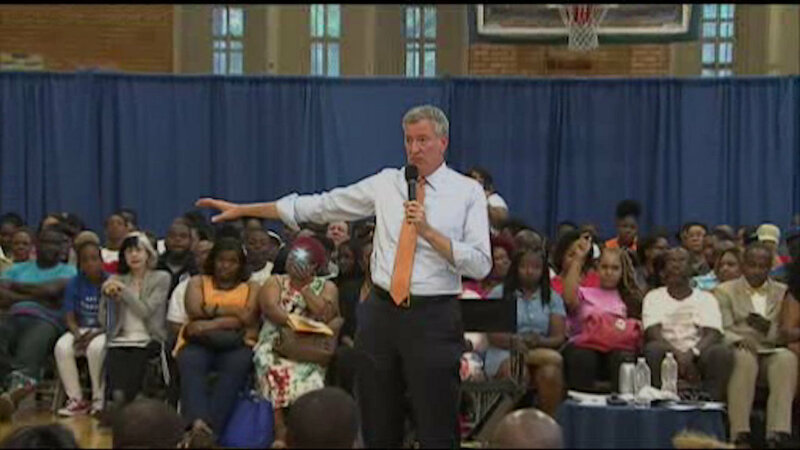 EAST FLATBUSH, Brooklyn -- Mayor Bill de Blasio held a town hall forum in Brooklyn to mark the final day of National Gun Violence Awareness Month. The event in East Flatbush was an open discussion of how guns impact life in Brooklyn and ways to prevent gun violence. Also Thursday night, the mayor said City Hall would be lit in orange to promote awareness. "As National Gun Violence Awareness Month comes to a close, we will light City Hall orange in honor of those we have lost to senseless gun violence," said Mayor de Blasio. "By lighting City Hall orange, we reiterate our pledge to combat gun violence and promote common-sense legislation that will save lives throughout this city and this nation." In 2013, New York State became the first state in the nation to designate an entire month to raising awareness around the issue of gun violence. Each June, cities, community organizations and New Yorkers across the state work to combat gun violence through annual heightened attention to gun violence and safety.